Dispensers are available in many varieties. Which one do you need? We offer a large selection of dispensers one or two component in different volumes sizes. Together with the brands COX and MK Sulzer is uniting the best expertise in 1- and 2-component adhesive applications under one umbrella. 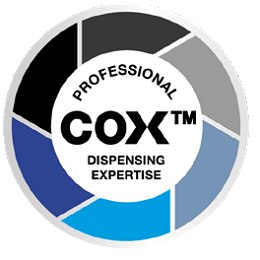 Whereas Mixpac is the leading system provider in the area of mixing, dosing and applying, COX is providing a wide range of professional, practical dispensers, while MK is the specialist for customized high quality dispensing solutions. Offering a range of excellent standard products, as well as a constant product development and surveillance of the market, Sulzer Mixpac is able to meet any of your various requirements. In close co-operation with manufacturers of sealants/adhesives and professional end users, we meet even very specific and stringent requirements. Adaptation and flexibility are key words for our product development. As a manufacturer, Sulzer Mixpac offers high reliability on deliveries and arrange for correct and customized labelling of our products. With these performances we have been appointed A-supplier with Europe’s leading distributors of dispensing tools. 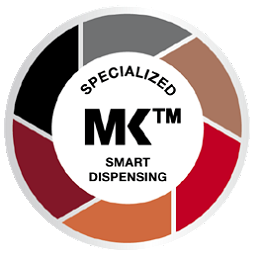 The renowned MK dispensers will be available through Sulzer Mixpac Ltd. and its affiliates while Sulzer Mixpac Ltd. has entrusted Sulzer Mixpac (UK) Ltd. with the manufacture of the dispensers. Easiflow LD Light duty metal frame manual applicator for 310ml cartridges. Easiflow LD Lite Light duty ABS polymer plastic frame manual applicator for 310ml cartridges. Easiflow HD Lite Light duty glass fibre reinforced plastic frame manual applicator for 310ml cartridges. Easiflow HD Light duty metal frame manual applicator for single component and 150ml coaxial cartridges. Midiflow Cartridge Light duty metal frame manual applicator for cartridges. Midiflow Combi Light duty plastic barrel manual applicator for cartridges and sachets. Powerflow Cartridge Medium duty steel frame manual applicator for single component and coaxial cartridges. Powerflow Cartridge HP Heavy duty metal frame high power manual applicator for single component and coaxial cartridges. Powerflow 1000S Medium duty metal frame applicator for short 1000ml cartridges that have a length of 210mm. Powerflow 1000L Medium duty metal frame applicator for long 1000ml cartridges that have a length of 324mm. Powerflow Quart Medium duty metal frame applicator for 946ml US Quart cartridges that have a length of 320mm. Powerflow Combi Medium duty aluminium barrel manual applicator for cartridges and sachets. Ultraflow Cartridge Heavy duty high power metal frame manual applicator for cartridges. Airflow 3 Cartridge Light duty pneumatic cartridge applicator for 310ml and 400ml cartridges. Airflow 3 Combi Light duty pneumatic applicator for 400ml cartridges and sachets. Airflow 3 Compact Combi Light duty pneumatic applicator for 310ml cartridges and 310ml, 400ml and 600ml sachets. Airflow 3 Combi HP Medium duty high power pneumatic applicator for cartridges and sachets. Jetflow 3 Compact Combi Light duty multipurpose pneumatic cartridge and sachet applicator, for use with conventional and sprayable sealants and adhesives. Easipower Plus Cartridge Medium duty lightweight 10.8V 1.5Ah lithium-ion battery operated applicator for 310ml cartridges. Easipower Plus Combi Medium duty lightweight 10.8V 1.5Ah lithium-ion battery operated cartridge and sachet applicator. Electraflow Plus Cartridge Heavy duty lightweight 18V lithium-ion battery operated 310ml cartridge applicator. Electraflow Plus Combi Heavy duty lightweight 18V lithium-ion battery operated applicator for cartridges and sachets. Powerflow Combi HP Heavy duty aluminium barrel high power manual applicator for cartridges and sachets. Powerflow Bulk Medium duty large capacity steel barrel for bulk materials and large capacity sachets. Ultraflow Combi Heavy duty high power aluminium barrel manual applicator for cartridges and sachets. Jetflow 3 Sachet Light duty multipurpose pneumatic sachet applicator for use with conventional and sprayable sealants and adhesives. Electraflow Plus FloorFix Heavy duty lightweight battery operated applicator for applying adhesives to floors. Ultraflow Bulk Medium duty high power manual applicator for bulk materials. Ultrapoint Manual Medium duty 800ml manual bulk applicator specially developed for low viscosity pointing and grouting materials. Ultrapoint Air Series I pneumatic 800ml bulk applicator specially developed for low viscosity pointing and grouting materials. CCM 310 LV Manual bi-mixer for 150ml, 220ml, 300ml and 330ml coaxial cartridges. CCM 310 Manual bi-mixer for 150ml, 220ml, 300ml and 330ml coaxial cartridges. CCM 310 X Manual bi-mixer for 150ml, 220ml, 300ml and 330ml coaxial cartridges. CCM 380 Manual bi-mixer for 380ml co-axial cartridges. CCM 380 X Manual bi-mixer for 380ml co-axial cartridges. CBM 25 Manual bi-mixer for rectangular flange cartridge systems. MR50 Manual bi-mixer for rectangular and S-type (oval) 50ml cartridges. PPM 75 Manual bi-mixer for 150ml standard and clip-together Plas Pak cartridges. RBM 100 LV Manual bi-mixer for Ritter two component cartridges (220ml). TBM/RBM/VBM 100 Manual bi-mixer for 200ml standard and clip-together cartridge systems. PPM 150 LV Manual bi-mixer for long (214-217mm) clip together cartridges in different ratios. PPM 150 Manual bi-mixer for long (214-217mm) clip together cartridges in different ratios. VBM 200 Manual bi-mixer for 400ml (1:1 and 2:1) cartridge systems. VBM (MR) 200 Manual bi-mixer for all variations of 200ml series Mixpac cartridges. VBM 200 X Manual bi-mixer for 400ml (1:1 and 2:1) cartridge systems. VBM (MR) 200 X Manual bi-mixer for all variations of 200ml series Mixpac cartridges. VBM 300 Manual bi-mixer for 300ml + 300ml Ritter ZKK cartridges. PPM 300 Manual multi-ratio bi-mixer for long (214-217mm) clip together cartridges 1:1 (300 + 300ml), 2:1 (300ml + 150ml), 4:1 (300ml + 75ml). PPM 300 X Manual multi-ratio bi-mixer for long (214-217mm) clip together cartridges 1:1 (300 + 300ml), 2:1 (300ml + 150ml). CBM 310 C Manual bi-mixer for two separate 310ml aluminium cartridges. CBM 310 XC Manual bi-mixer for two separate 310ml aluminium cartridges. CBM 310 XS Manual bi-mixer for two separate 310ml sachets. CBM 310 CP (X) Manual bi-mixer for two separate 310ml aluminium cartridges. PPM 330 Manual bi-mixer for long (214-217mm) clip together cartridges 1:10 (300ml + 30ml). VBM (MR) 400 X Manual bi-mixer 400ml cartridges. Conversion kit supplied. VBM (MR) 400 Manual bi-mixer for 400ml cartridges. Conversion kit supplied. PPM 600 X Manual bi-mixer for long (214-217mm) PlasPak standard and clip-together cartridges 2:1 (600ml + 300ml). PPM 1500 X Manual bi-mixer for long (214-217mm) clip together cartridges. 1:1 (750ml + 750ml). CCA 380 B Series I pneumatic bi-mixer for 380ml co-axial cartridges. CCA 380 A Series I pneumatic bi-mixer for 380ml co-axial cartridges. S3 CCA 380 A Series 3 pneumatic applicator for 380ml coaxial cartridges. S3 CCA 380 A HP Series 3 pneumatic applicator for 380ml coaxial cartridges. CBA 25 Series I pneumatic applicator for 50ml 1:1 & 2:1 cartridges (rectangular flange). CBA 50 Series II pneumatic bi-mixer for 50ml cartridges (rectangular and reinforced flange). RBA 100 LP Series II pneumatic bi-mixer for Ritter ZKK 220ml 1:1 cartridges. VBA 100 LP Series I pneumatic bi-mixer for 200ml cartridges. RBA 100 HP Series I pneumatic bi-mixer for Ritter 220ml 1:1 cartridges. VBA 100 HP Series I pneumatic bi-mixer for 200ml cartridges. PPA 150 LP Series I pneumatic bi-mixer for long (214-217mm) clip together and standard PlasPak cartridges. PPA 150 HP Series I pneumatic bi-mixer for long clip-together and standard PlasPak cartridges 1:1 (75ml + 75ml). S3 PPA 150 HP Series 3 pneumatic bi-mixer for long clip-together and standard PlasPak cartridges 1:1 (75ml + 75ml). S3 CBA 200 C HP Series 3 pneumatic bi-mixer for two separate 200ml aluminium cartridges. CBA 200 C Series I pneumatic bi-mixer for two separate 200ml aluminium cartridges. VBA (MR) 200 A Series I pneumatic bi-mixer for all variations of 200ml series Mixpac cartridges. RBA 200 B Series I pneumatic bi-mixer for Ritter 380ml 1:1 cartridges. VBA 200 B Series I pneumatic bi-mixer for 1:1 ratio, 400ml (200ml + 200ml) cartridges. VBA 200 A Series I pneumatic bi-mixer for 1:1 ratio, 400ml (200ml + 200ml) cartridges. PPA 300 B Series I pneumatic bi-mixer for long (214-217mm) clip together and standard PlasPak and Ritter cartridges. RBA 300 B Series I pneumatic bi-mixer for the Ritter 620ml cartridge. S3 RBA 300 B Series 3 pneumatic bi-mixer for the Ritter 620ml cartridge. S3 PPA 300A Series 3 pneumatic bi-mixer for long (214-217mm) clip together and standard PlasPak and Ritter cartridges. PPA 300 A Series I pneumatic bi-mixer for long (214-217mm) clip together and standard PlasPak and Ritter cartridges. CBA 310 C Series I pneumatic bi-mixer for two separate 310ml aluminium cartridges. CBA 330 B Series I pneumatic bi-mixer used for 330ml and 345ml cartridges. VBA (MR) 400 B Series I pneumatic bi-mixer for all variations of 400ml series Mixpac cartridges. VBA (MR) 400 A Series I pneumatic bi-mixer for all variations of 400ml series Mixpac cartridges. CBA 600 S Series I pneumatic bi-mixer used with two separate 600ml sachets. PPA 600 A Series I pneumatic bi-mixer for long (214-217mm) clip together cartridges. PPA 750 Series I pneumatic bi-mixer for long (214-217mm) clip together and standard 825ml PlasPak and Ritter cartridges. PPA 1500 Series I pneumatic bi-mixer used for long (214-217mm) clip together 1500ml cartridges. S3 PPA 1500 Series 3 pneumatic bi-mixer used for long (214-217mm) clip together 1500ml cartridges. The conversion kit now accepts multi-ratio 50ml cartridge systems (1:1, 2:1, 4:1, and 10:1). The sleeve is designed to accept all four ratios of the A50 and B50 cartridge system. A different plunger is required for each ratio. This low cost kit is an exciting alternative to more expensive dispensers. 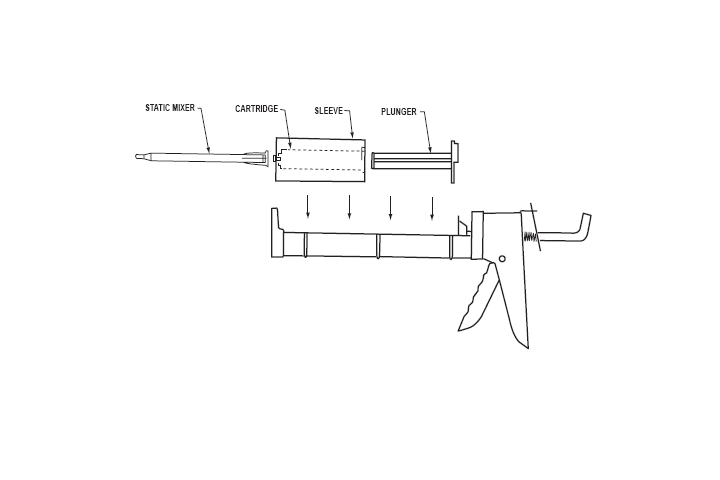 The reusable kit can be used with all “off the shelf” 310 ml European caulking guns. A practical choice for price sensitive markets such as DIY/home repair, field installations and occasional industrial users. Insert the cartridge, nose first, through the oval opening (this is the end with the smaller opening) of the sleeve until the cartridge flange fits snugly against the end of the sleeve. 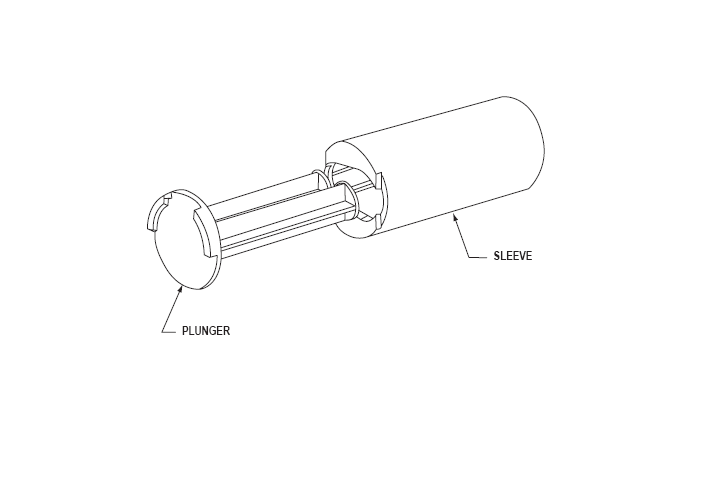 Place plunger in the back end of the cartridge. Connect static mixer to cartridge. Conclusion: If you try to use a high viscosity product in a ratio of 12: 1 gun tries you have to deliver a lot of power. If you have a low viscosity product in a ratio of 26:1 gun you have to squeeze more (than necessary) compared to a lower internal rate.